Originally brewed by monks near Dinant, Belgium, Leffe Blonde continues to be brewed to the traditional recipe created in 1240 in the monastery. 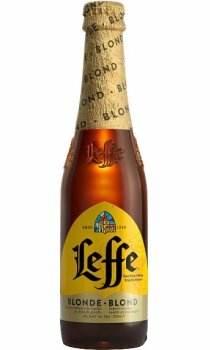 Due to a licensing agreement dating back to the early 1950's Leffe brewing activities moved to the small Belgium university town of Leuven and the Abbey still receives royalties on sales. Leffe Blonde with its distinct heritage and appealing taste is without doubt the number one among Belgian Abbey beers. Gold Medal, 1998 Chicago Beer awards. Silver Medal, 1995 World Beer Championship. Bronze Medal, 1999 Australia International Beer awards. This is a great beer. I really love this one.